Agate & moss agate, cut & polished using abrasives, most probably fashioned by turning on a bow-driven lathe. This cup and saucer would have been made primarily as an ornament rather than for use. Although agate is a tough and durable material, it is prone to crack when subjected to sudden and significant changes in temperature. Also, when worked to give fine edges or thicknesses, it is easily chipped or cracked when knocked. With this in mind, finely worked agate vessels that survive undamaged are uncommon. 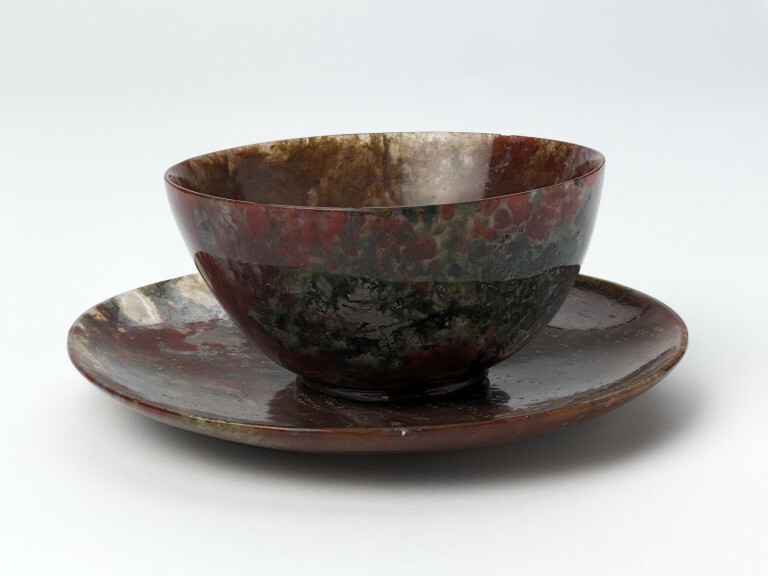 The cup and saucer were made in India in the 19th century, with most of the fashioning process involving a combination of hand-working and turning on a bow-driven lathe. 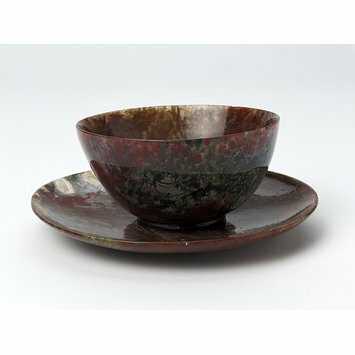 A round cup and saucer fashioned in red, dark green & beige/brown agate, and polished all over. Both the cup and the saucer have a short foot with the cup's being recessed and the saucer's being flat. Both cup and saucer have damage to their rims. This cup and saucer were made in India in the 19th century and were acquired by Arthur Wells who was a Nottingham solicitor and Clerk of the Peace. He was a keen traveller and was made a Fellow of the Geographical Society. He is considered to be the first private British collector of Chinese jade and his collection of jade and other hardstone objects from South Asia was on exhibition at the South Kensington Museum at the time of his death in 1882. This collection was left to the museum in his will - the Wells Bequest.